Firstly, the agricultural produce of the Netherlands. 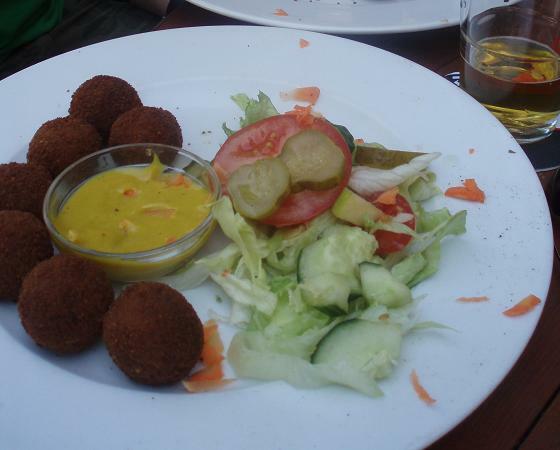 Vegetables tend to form a more important part of the Dutch diet than meat, but beef, pork and chicken are all eaten. Secondly, the country's history as a seafaring nation. In general, fish and seafood (including cod, eel, herring, mackerel, mussels, oysters, plaice, salmon, sardines, soleidae, shrimp, trout and tuna) are all eaten in the Netherlands. Thirdly, the Dutch established a colonial empire, and this too left its mark on Dutch cuisine. The most important Dutch colony was the Dutch East Indies (Dutch: Nederlands-Indië), which is today known as Indonesia. The Dutch were in the East Indies for approximately 250 years, and a result Indonesian dishes such as Nasi goreng (spicy rice with chicken or pork) have become Dutch dishes too! Balkenbrij - A liverwurst sausage loaf (Dutch: Leverworst). It is made from pork and pork liver, the latter of which gives it a distinctive liver-taste. It is prepared by cutting it into slices, each about ½ inch (1 centimeter) thick, which are then fried. Bitterballen - A meat-based snack, often eaten as a fastfood. Bitterballen are made from chopped or ground beef, beef broth, flour, butter and seasonings (sometimes including parsley, nutmeg or even curry powder). They are made into balls just over 1 inch in diameter (3 centimeters), and then deep-fried. Bitterballen are usually served with a small bowl of mustard for dipping. Boerenkoolstamppot - This is a stew made from potato and kale. It is usually served with gravy and rookwurst (Dutch spicy sausage). Frikandel - A skinless sausage which is deep-fried and eaten warm. It is usually made from a combination of pork, beef, chicken and horse meat, and is sometimes served on a bun ("broodje frikandel"). Hete bliksem - Boiled potatoes and green apples. It is eaten with with syrup (Dutch: Stroop), or diced dry-cured ham flavored with juniper (Dutch: Speck). Hutspot - This is a traditional Dutch stew. It is made using boiled and mashed potatoes with carrots and onions. Nasi goreng - This is the Dutch version of a recipe from Indonesian cuisine. 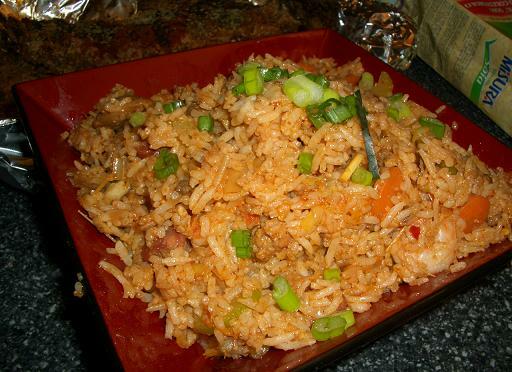 The principal ingredient is fried rice, but egg, prawn, onions, and shallot may also be added. The dish is flavored with spices and soy sauce. Because of the familiarity of the dish in the Netherlands, Dutch people tend to refer all varieties of East Asian fried rice as "nasi goreng". Stamppot rauwe andijvie - Raw endive (a variant of chicory) mashed into potatoes, and served with diced fried juniper-flavored ham (Dutch: Speck). Tête de veaux - This dish is originally from the province of Limburg. It is beef with mushrooms in a tomato sauce. Zuurkoolstamppot - Mashed potatoes with sauerkraut (pickled cabbage) It is normally served with sausage or bacon, and sometimes flavored with curry powder, raisins or pineapple. Appeltaart - Apple pie. Appeltaart usually has a lattice-style topping and icing, and as well as apple will typically contain lemon, raisins and cinnamon. Bossche bol - A cake ball, filled with cream and coated with chocolate. Oliebollen - Donuts made by deep-frying dough. After cooking, they are allowed to cool and will rise, and are then covered with powdered sugar. Oliebollen are especially popular during the Christmas period, and around New Year, and are also often served at fairs. Spekkoek - Dutch-Indonesian spicy dessert made from many layers of pastry. 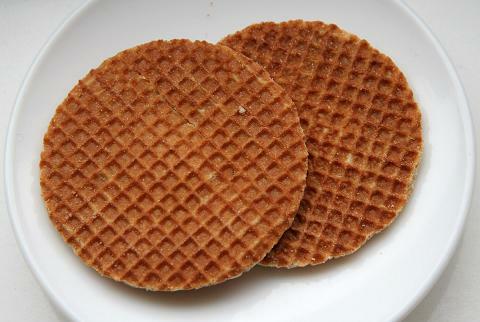 Stroopwafel - Two round waffle-like wafers with a caramel filling sandwiched between them. Vlaai - A large round fruit pie filled with fruit marmalade.